The Modified one i want to change its look, just like in the Movies, with all its marks,damages and scratches.I searched for some reference pictures just to get some Ideas. One further point is the power supply. For all the Lights and extras the Battery power is not going to be enough making everything work out nice. Just like my Millenium Falcon i want to use a Power Adaptor. 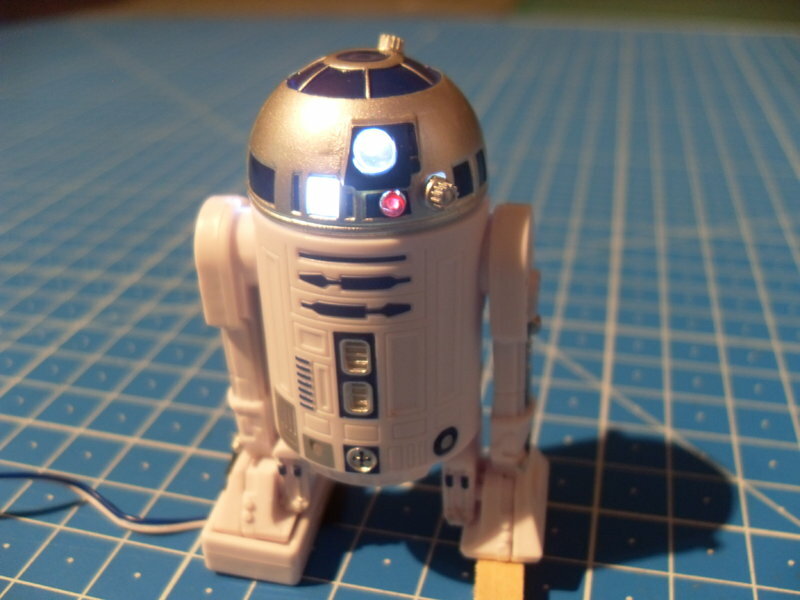 All original LEDs are already replaced. I ordered new ones with resistors.The computer consoles i redesigned. Here I have completely sanded them, and drilled new holes for the lighting. I want to replace the entire cockpit lighting with fiber optics. By starting my built some components have been slightly edited. 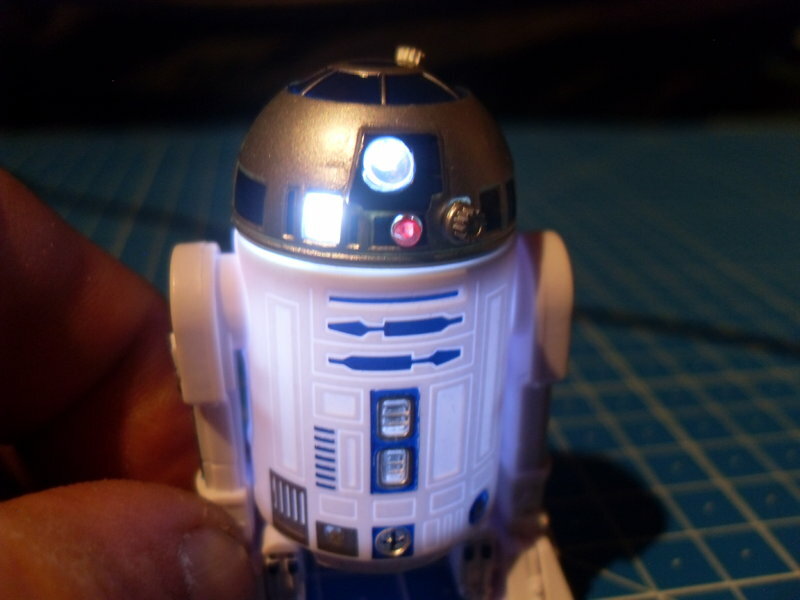 I had to paint some parts from R2D2 from the inside because it looked like a Michelin figure when the LED was switched on. 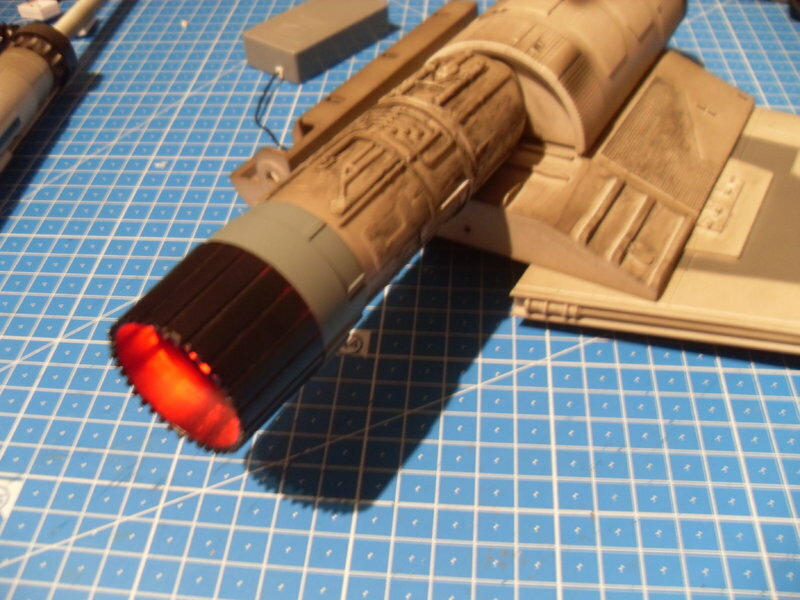 The same i had to do with the laser cannons. 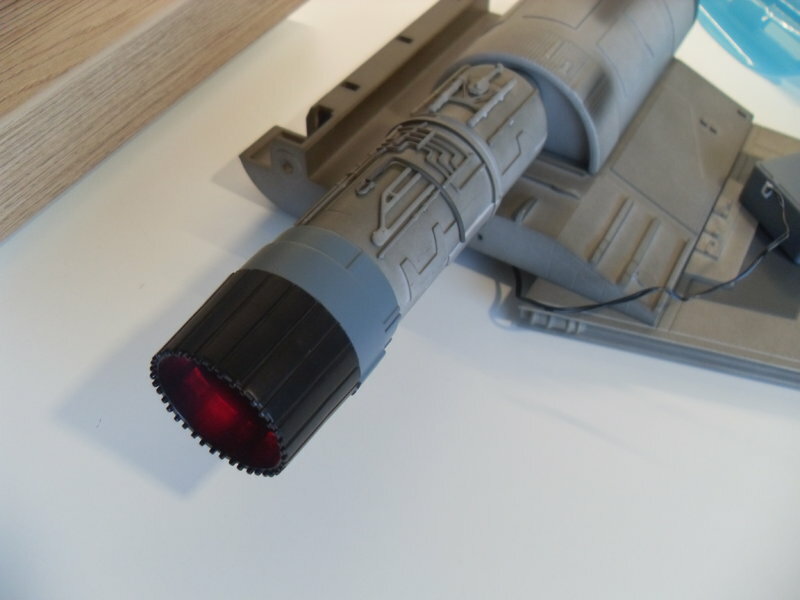 Now the laser only gets its full effect at the front. Now Problems with the Subengines. 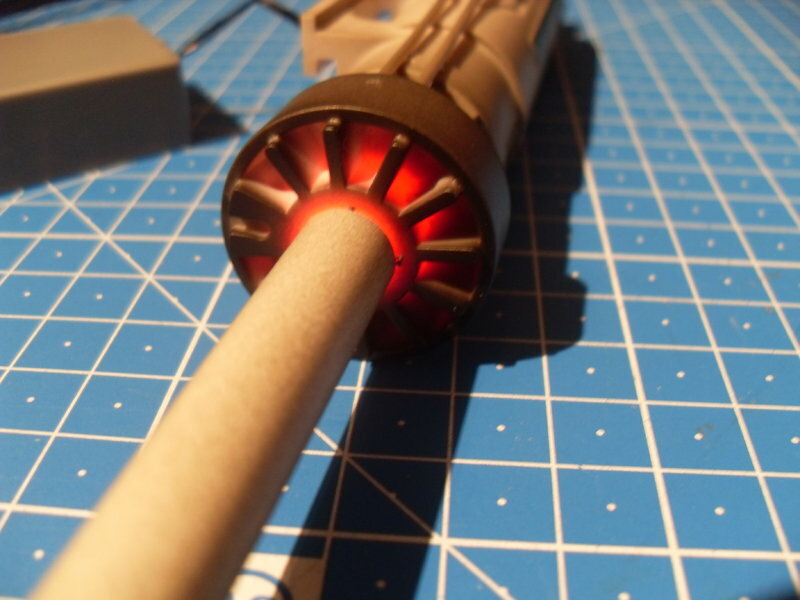 If you look at the brightness of the Subengine, you can imagine what it looks like when four pieces of them light up. The pictures show the building status up to issue 14. Nice work Andreas, looking forward to seeing this come together. Great start, looking forward to seeing more of this build. 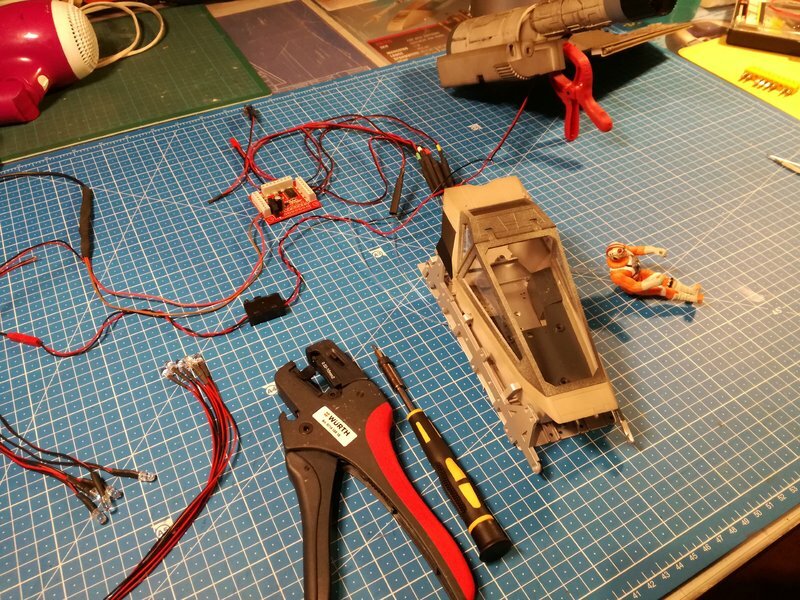 After receiving some parts i ordered for the X-Wing i started Modifying. 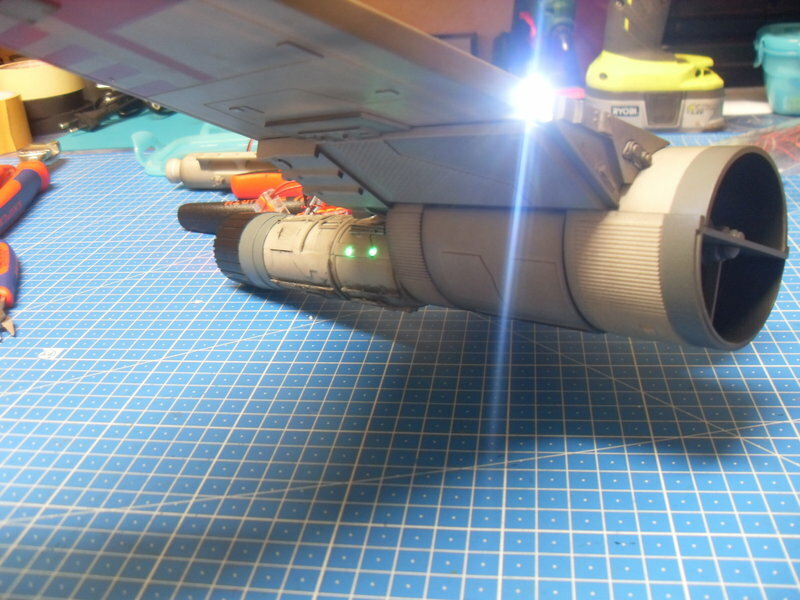 I want to change the lights in the cockpit by using light fiber optics. Just attached two short Clips on my youtube channel how it is going to look like. The first computer console has been finished with fiber optics, and i made i test run. 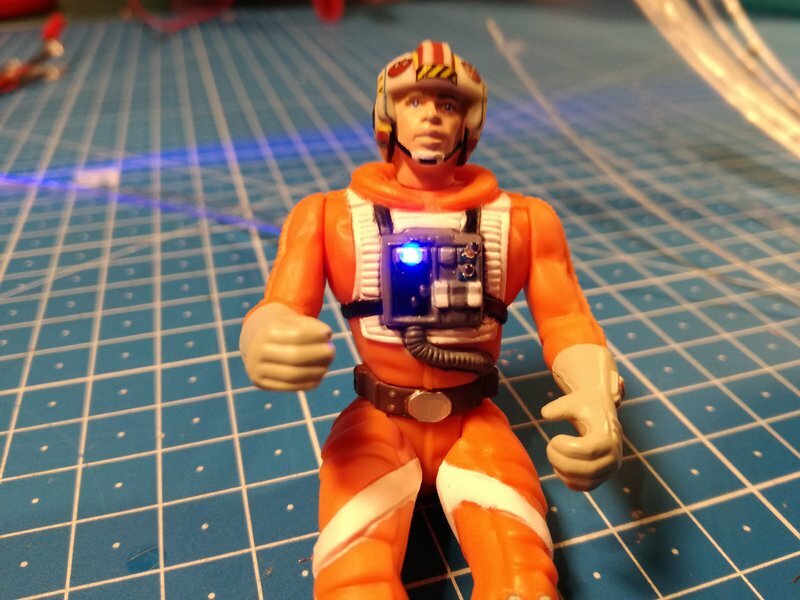 The X-Wing is going to be controlled by running light modules. It is possible to change the Running sequences. Everything is designed for 4-12 volt voltage. 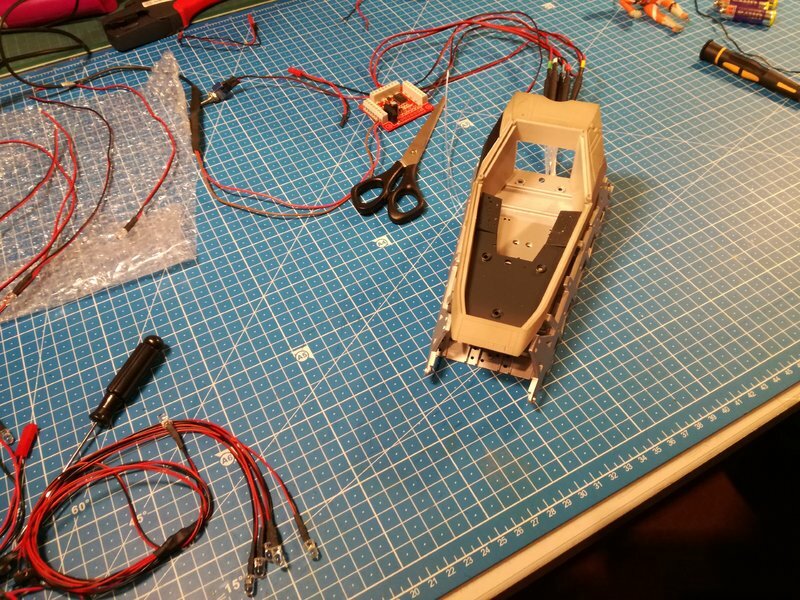 For the sub engines, I replaced the original LEDs, and replaced them with pulsating LEDs. 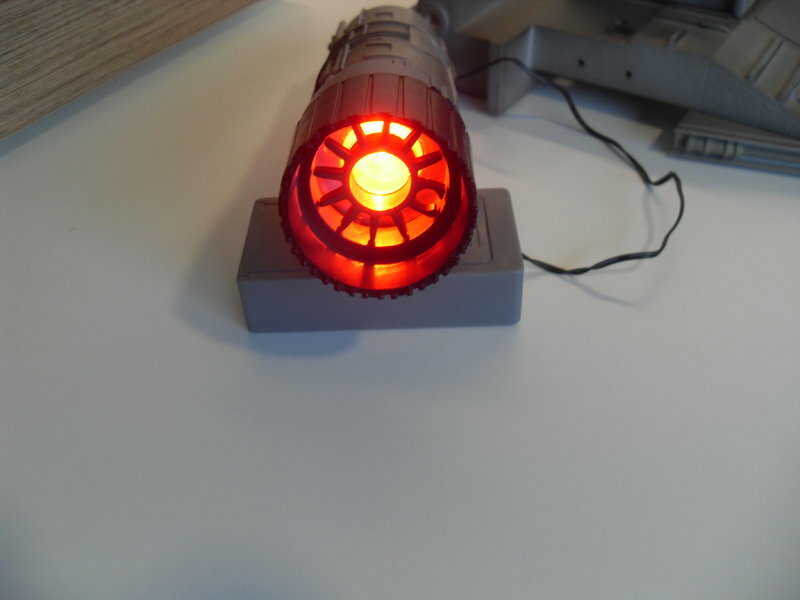 I also modified Luke's survival equipment with 3 fiber optic cables. 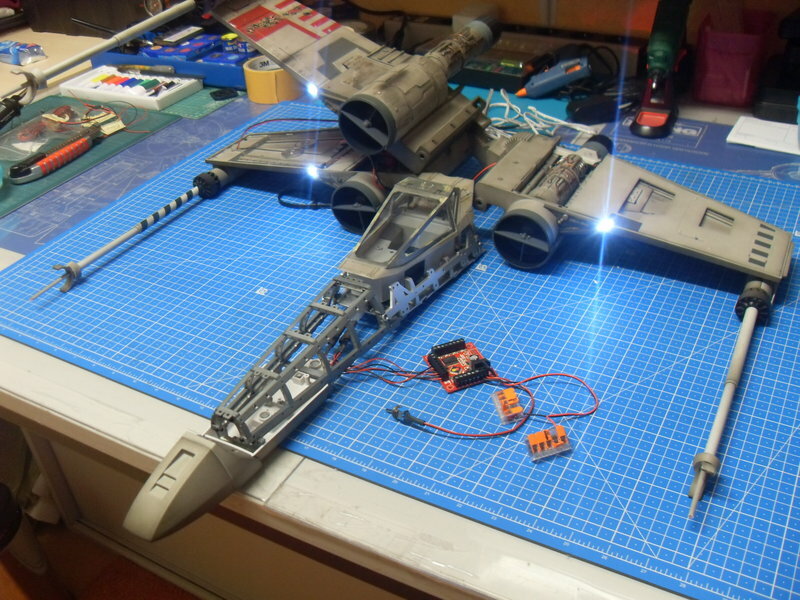 It is still a long way to go to put on all the lights the X-Wing has got. Searching for reverence Pictures i found some pics that shows the X-Wing from Luke which had got 4 white Position lights in the Wings. Just to see it only check his crash on Dagobah in the swamp. Loving the modifications you are making, it should be very impressive when complete. I look forward to seeing more. I would like to put on a few Victory Marks on my X-Wing. I have already found a few "enemies". To get it done I have ordered some sticker foil in gray DIN A4 for laser printing.I hope to get a fine result. As soon as they arrive I will start some "experiments". 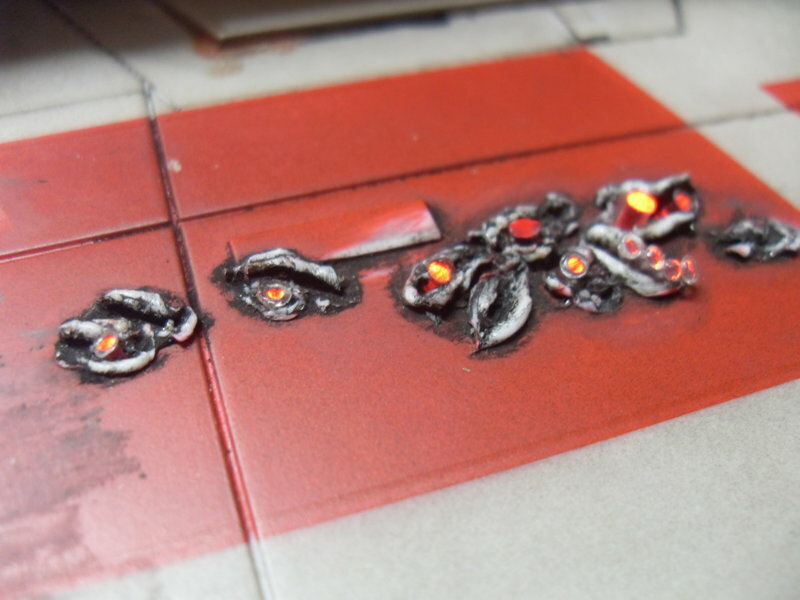 A nice touch with the victory markings, should look great. 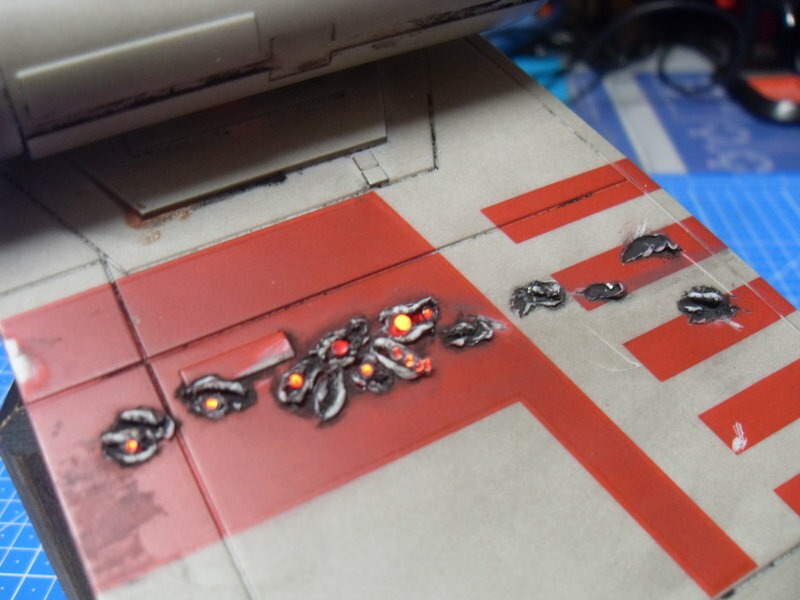 After a long break due to illness, I can finally continue with the X-Wing.First step, I provided one of the wings with Blaster-marks. 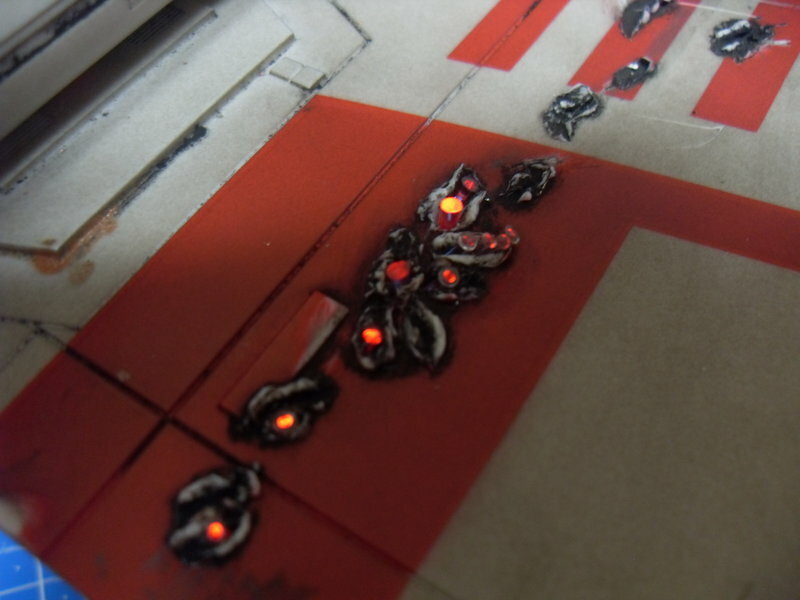 To simulate fire I used LED'S with flicker effect. 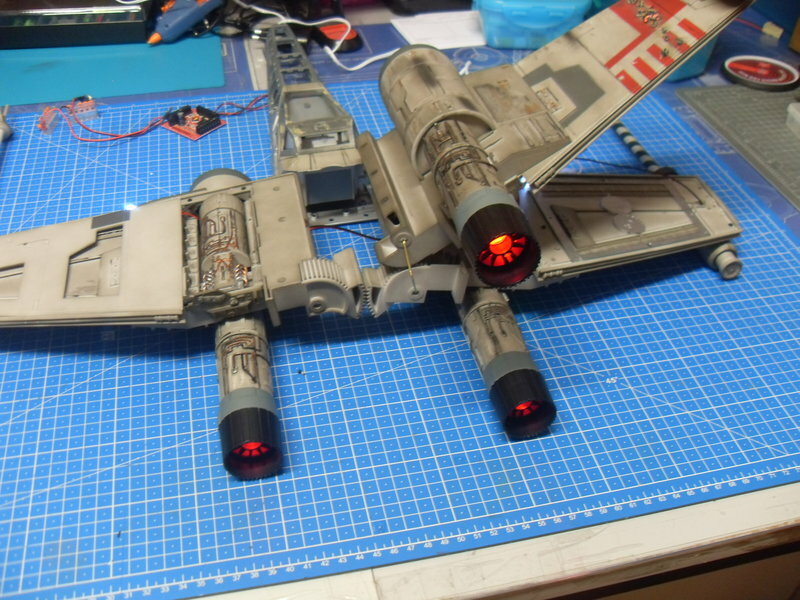 Only the LEDs do not fit in the wing, so the LED's were equipped with fiber optic cables. Currently the third wing is going to get completed. Only one I have provided with Blaster-marks. Even if it seems boring to one or the other that it is only wing mounting in the first 30 issues, I am not so. I take time for the wings. 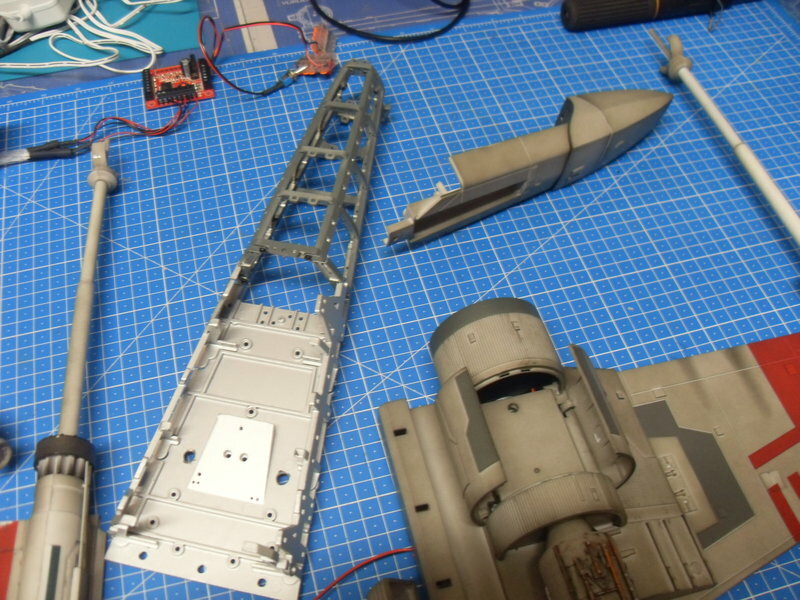 Each of the wings was provided with landing lights, also all power lines must be relocated. 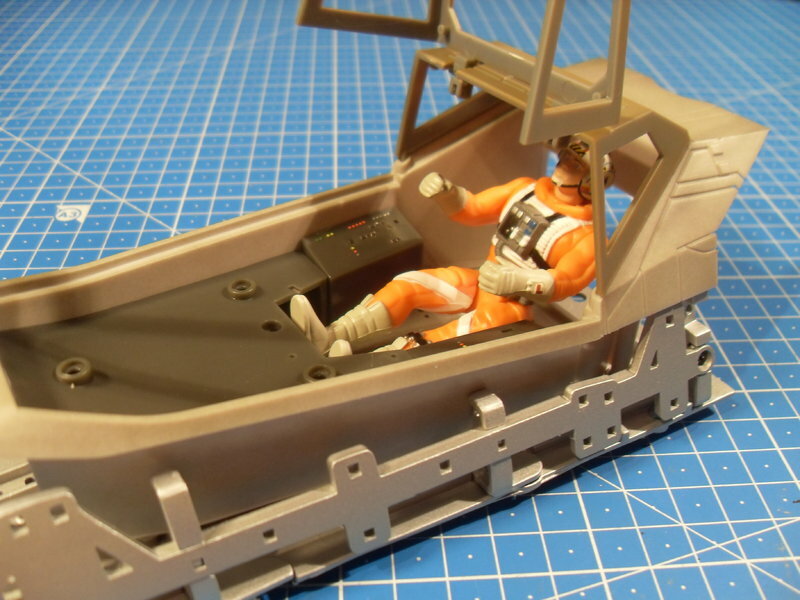 electronic components for the extras must be housed in the nose of the X-Wing. The same applies to the electrical cables and optical fibers. Still a long way to go. Now 3 wings are as good as finished. Landing lights, position lights, done at 3 wings. A lot of electronic is still pending. 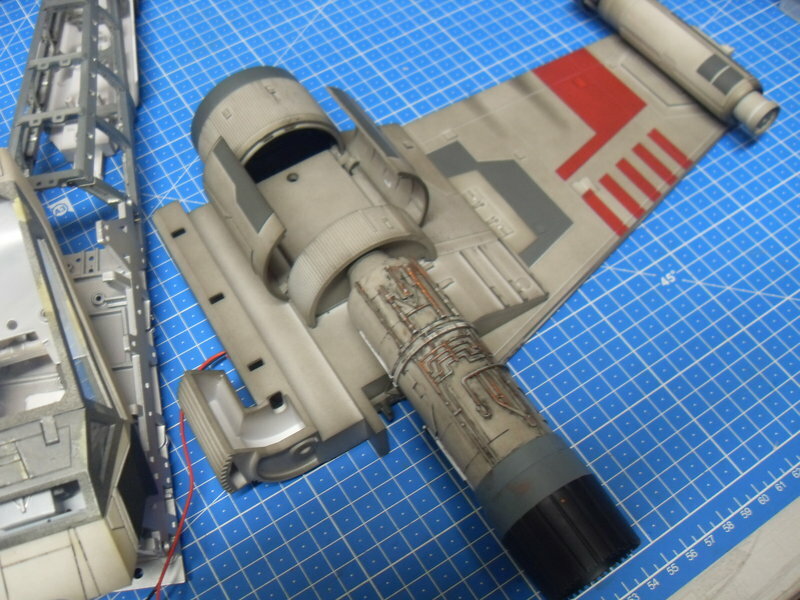 Have just put the X-Wing for viewing provisionally together. In any case, this will be a great model when finished. 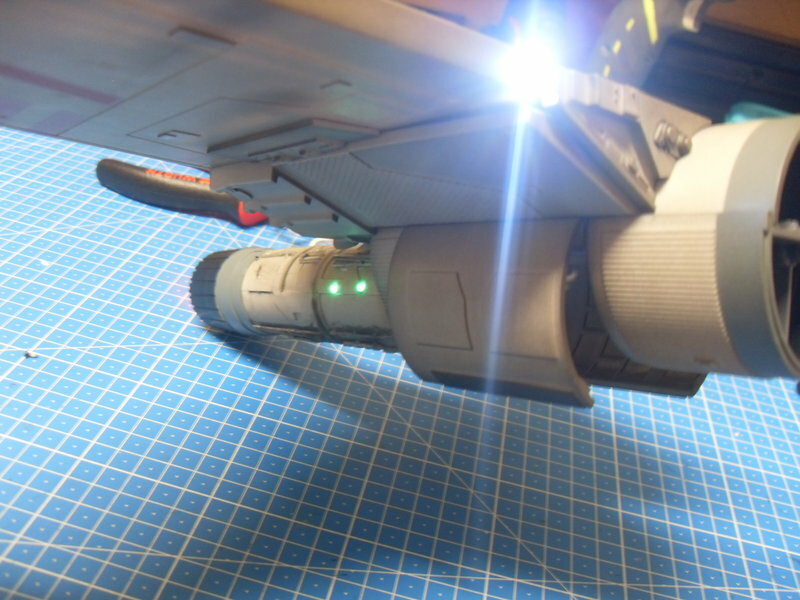 Very nice work Andreas, you are showing some great skills here, especially with your weathering and the fitting of all of those electronics. Great work Andreas, coming on very nicely. 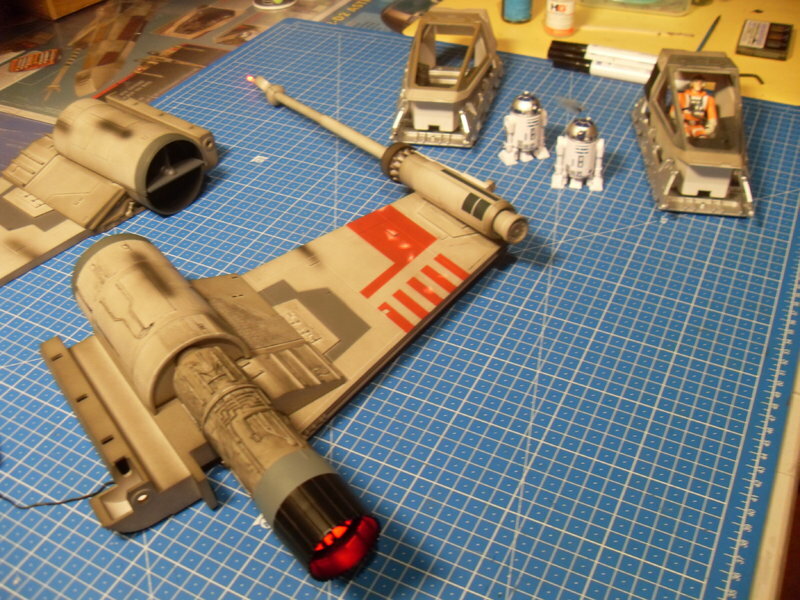 Also as discussed here about the quality of the X-Wing to the Falcon I just wan´t to say, there is no difference. 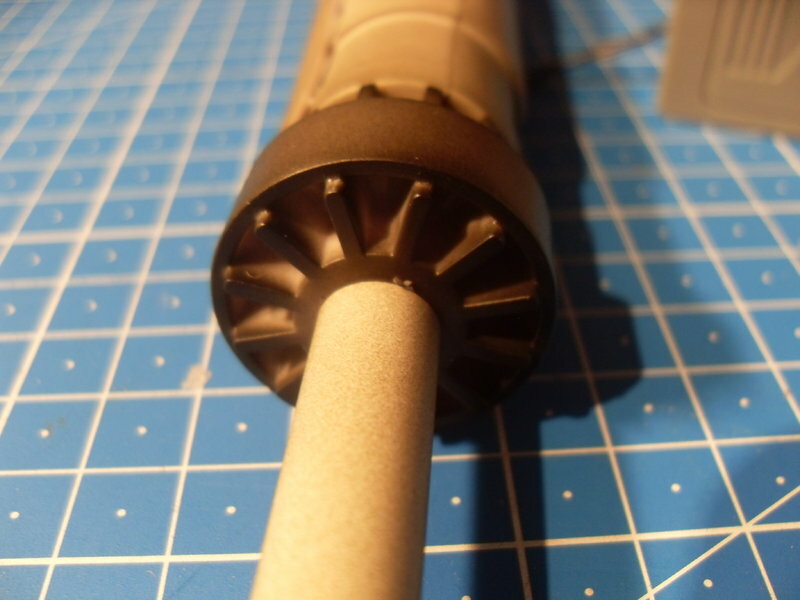 I am very far ahead so I can make my own judgment about the quality of the parts. Till now everything fits. 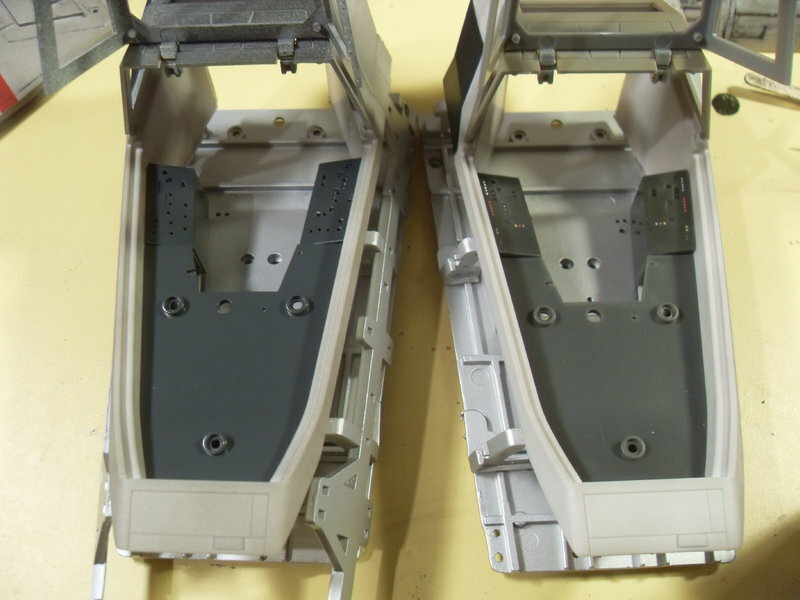 Whether it is about the cladding panels or frame parts. Sure, one or the other will say "Boring always only wings", but the X-Wing has got 4 wings ,and they must be done. I have now put 6 wings together. 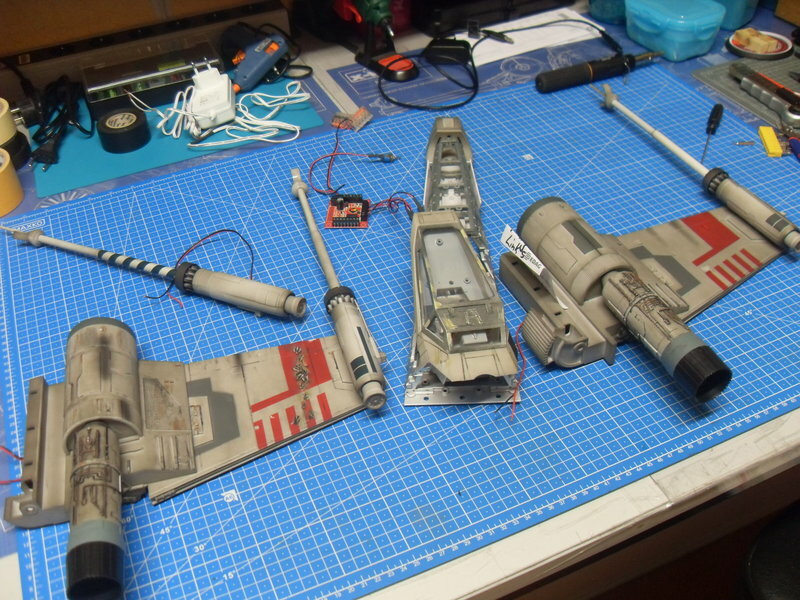 I am building the X-Wing twice,and can now build the Wings together while i´m sleeping. 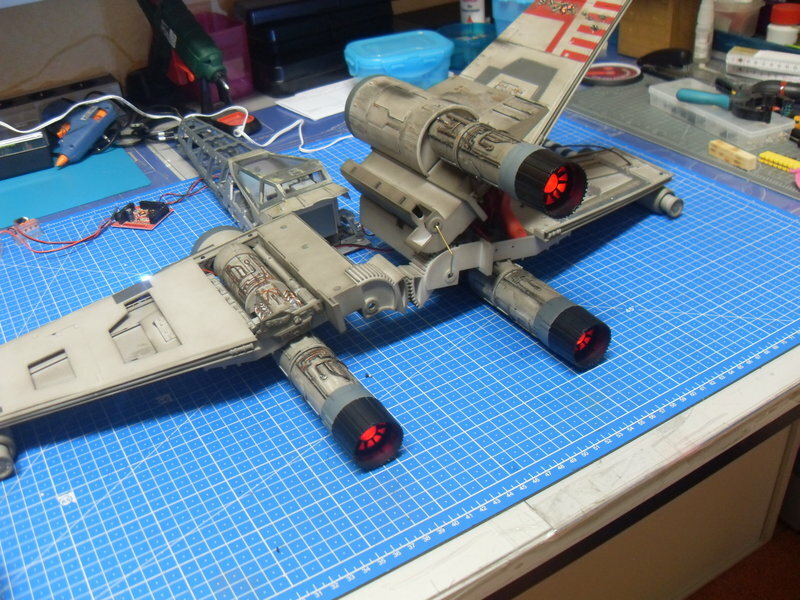 One X-Wing standard, one modified. 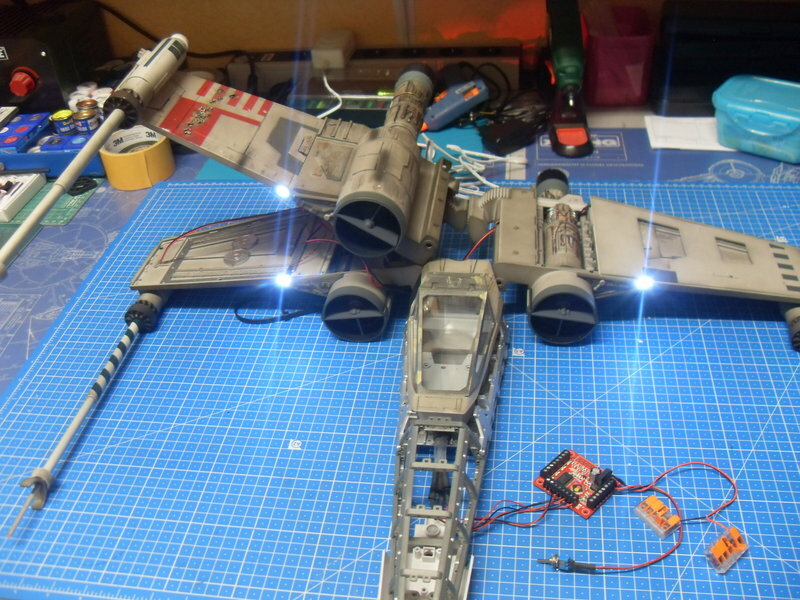 The modified X-Wing works with 12 volts. 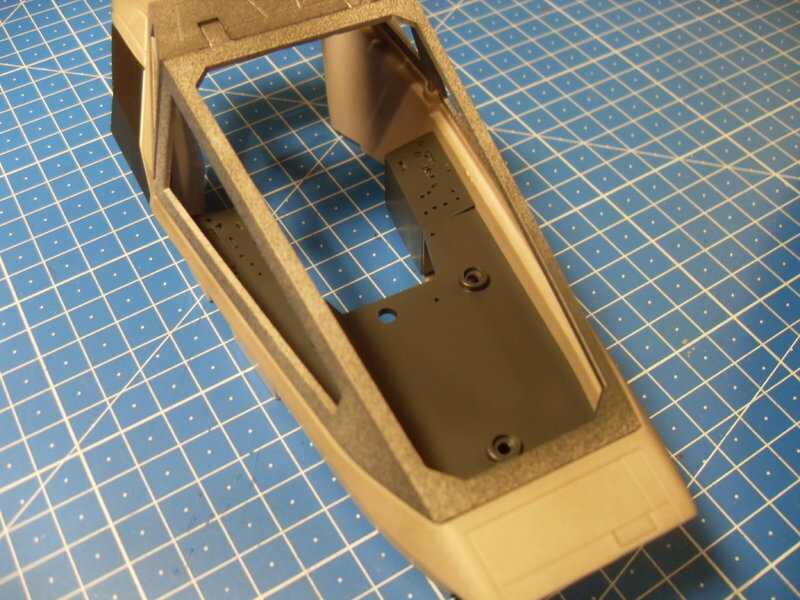 All parts are delivered ready painted and the electronics are included.For a model builder newbie so no problem if he does not want to make any modifications. Just assemble, and the X-Wing is ready. 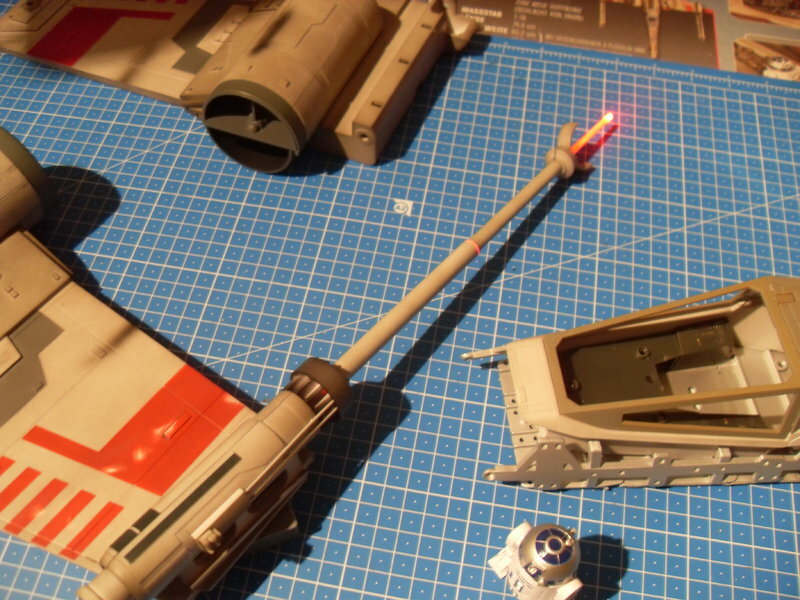 For modifications, the X-Wing offers a lot of possibilities. Starting with the colors, lights, fiber optics, sound, etc.Space for the electronics is enough available. Just make a good planning in advance. 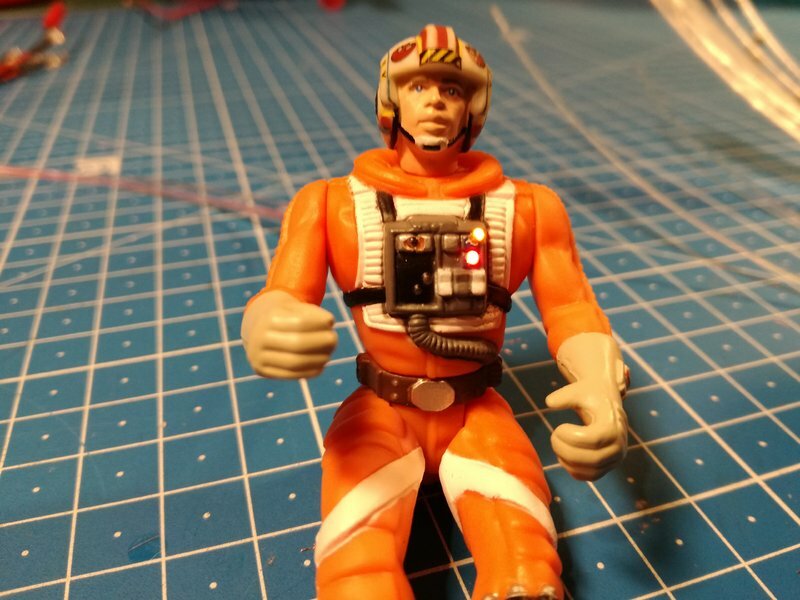 For all X-Wing model builders i wish fun and success in building. If someone needs a tip or has got a question, here I will gladly support. great work and great to see it with a "nose" on it. At the point you are with your build how many more packs do you need to finish the model?